30 Seconds Over Tokyo - MGM's elite strikeforce at work. I was of two minds about the timing of this blog, with the devastating Japan earthquake and tsunami still very fresh in our minds, and have held back to some degree out of respect to the Japan based readers of this blog (yes, I do look at the blog stats in trying to figure out just who the hell's interested in all of this old matte stuff, and to my amazement, people are!) . Mervyn Leroy's THIRTY SECONDS OVER TOKYO released in 1944 was one of a large number of, occasionally excellent, mostly Hollywood made war pictures produced to bolster the morale of the allies in the latter days of World War II. Among the memorable war pictures which appeared in the forties that struck a chord with me were the brilliant Raoul Walsh-Errol Flynn OBJECTIVE BURMA (1945) which is a personal favourite of mine, and a real white knuckle ride if ever there were one. James Cagney's Henry Hathaway helmed edge of the seat wartime thriller 13 RUE MADELEINE (1947) is indeed another top drawer piece of war cinema among numerous others. I'd include the brilliant British entry THE DAMBUSTERS here too, though it came about some 10 years post war. 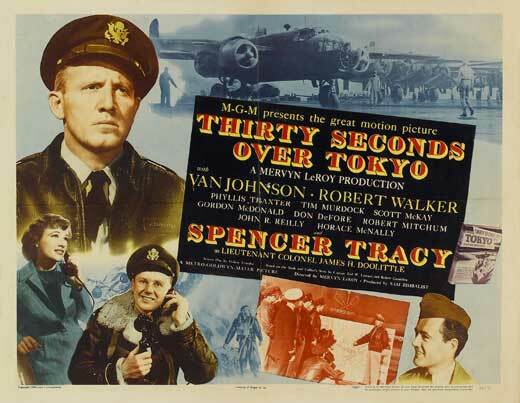 THIRTY SECONDS OVER TOKYO is an all time favourite for me for a number of reasons. 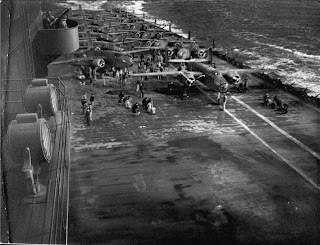 The very nature of the highly secretive Doolittle mission to train an elite force of pilots with just minimal lead up time, to launch an all out B25 bomber air assault on Tokyo on April 18th 1942. The catch being that the only means of getting a squadron of sixteen B25's anywhere near Japan was to have them launch from the US aircraft carrier Hornet cruising in the Western Pacific Ocean.... a feat not normally expected of the B25, which was a US Army 'terra firma' based bomber. The pilots were required to train for unbelievably short take off runs, often getting their 'baby' in the air in a third of the distance normally required from a traditional land based runway situation. Any miscalculations in engine revs and you're "in the drink", as it were. 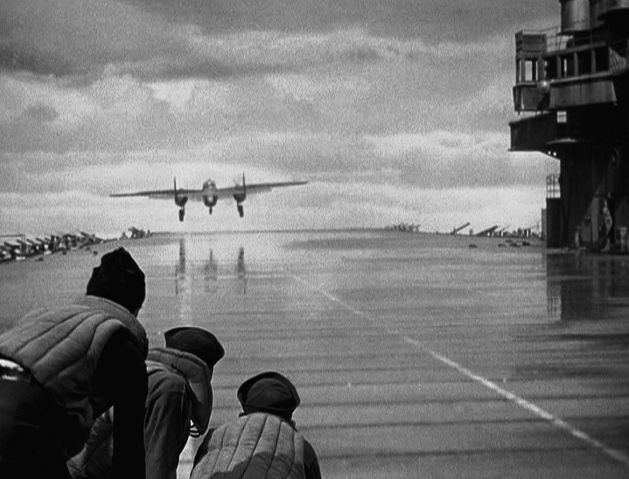 The true story was based upon the actual accounts from one of the surviving squadron pilots and, central action set piece aside, makes up for thrilling screen entertainment in itself. Nothing like a good 'whip a crack team into shape for a dangerous mission' story for this commentator! 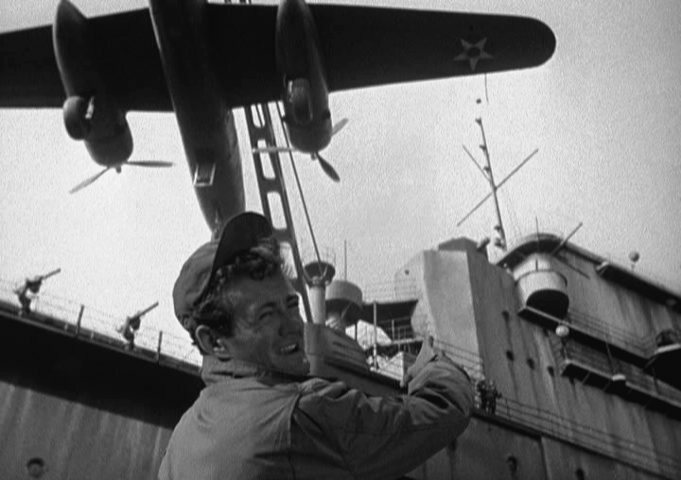 Spencer Tracy plays Lieutenant Colonel Jimmie Doolittle and I should add in no way is this Doolittle related to the Rex Harrison character of the same name, or a whole different scenario might have presented itself! Among the terrific cast are the always reliable Van Johnson and a young Robert Mitchum. I just love older war films, and aside from the sometimes toe curling patriotism and squirm inducing flag waving at times, which to be frank was totally okay and expected under the circumstances and world events in which they were released, are generally infinitely more satisfying pieces of cinema than their modern day counterparts such as the enigmatic and hugely over rated FLAGS OF OUR FATHERS and SAVING PRIVATE RYAN school. All of the ad campaigns were unbelievably dull affairs. 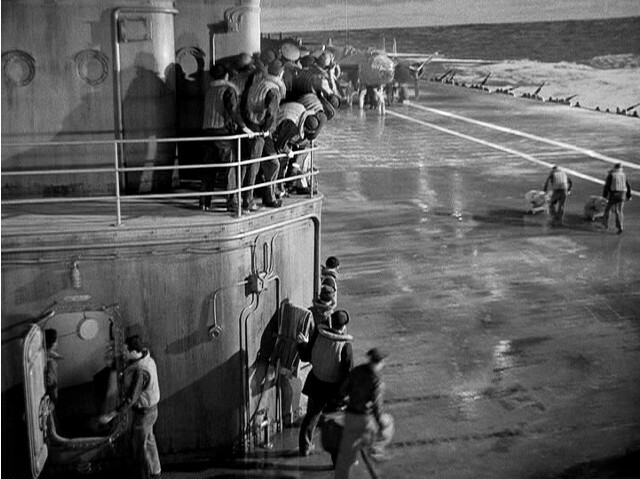 Naturally enough, the main reasons for this film appearing on my blog is that it's not only a great film, but one of THE finest big budget special effects extravaganzas to come from the Metro Goldwyn Mayer film factory, and is THE finest hour, bar none, of legendary effects supervisor Albert Arnold Gillespie - best known in the industry simply as 'Buddy'. This, as we know is a matte painting blog primarily, and 30 SECONDS is well catered for in that department, with some astonishing results appearing throughout the second act under the ever vigilant eagle eye of Warren Newcombe, with some particularly fascinating painted shots, quite possibly executed by celebrated film and effects pioneer, Norman Dawn, that I've been curious about for years and will be explained below. Above all else, this is a film that stands head and shoulders above the rest in it's phenomenal miniature work - work which still stands the test of time and looks as sensational today as it did some 65 years ago. 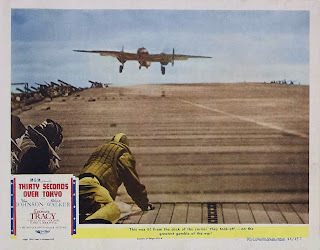 The bomb run action piece has since appeared as stock footage in other war films, most notably the Charlton Heston 1976 film THE BATTLE OF MIDWAY, and it still looked better than anything else in that film - and most of that consisted of stolen effects shots from several other films! Gillespie with the original MGM 'Leo the Lion', and right, at home in 1973. 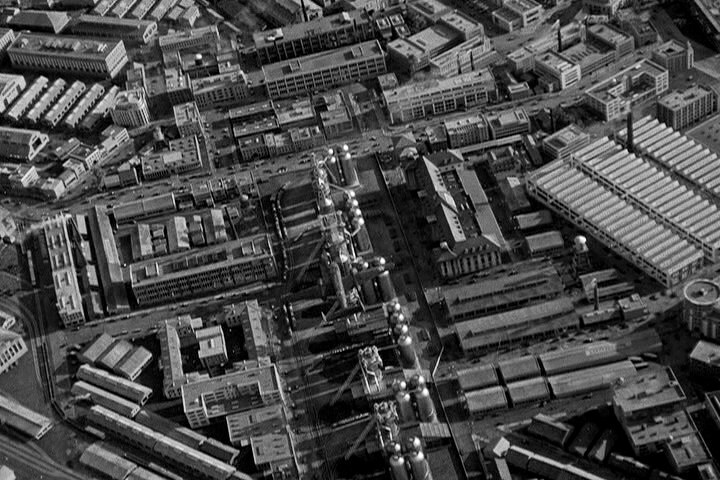 I've briefly outlined Gillespie's background in my previous blog on FORBIDDEN PLANET, (which for those interested now has several updates added from new info that came into my possession a few days ago). A Texas native, Buddy was one of the true icons of the movie industry, accumulating along the way a vast tally of credits in art direction and titles, numbering, according to most sources in the hundreds (and this was all before he moved into the special effects arena where as many again credits for effects work would acrue over the next thirty years) - with much of this body of work appearing in pre-sound era pictures for Paramount for a time from 1922 and then a few years later at MGM where he remained for the rest of his long career up to the early sixties. It was mainly due to the influence and broad ranging talents of British born art director turned special effects designer James Basevi that guided Gillespie fully into the special effects field. 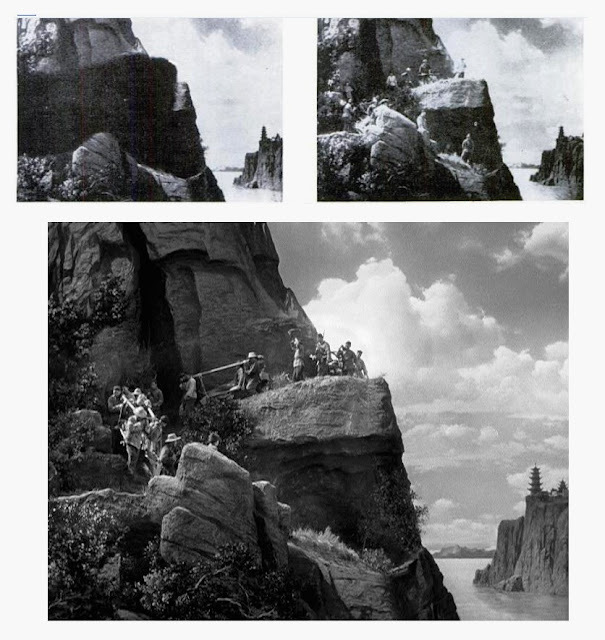 In previous blogs here I've illustrated many of the innovative hanging foreground miniature effects in films such as the original BEN HUR (1925) in which Gillespie was heavily involved. His gravitas being as it was, in later years it wasn't uncommon for Gillespie to employ some three separate effects units simultaneously on big effects shows such as 30 SECONDS OVER TOKYO. An anecdote from an MGM stagehand is amusing; "We all knew when Buddy was on the scene, because the whole building just reeked of his stinking pipe". 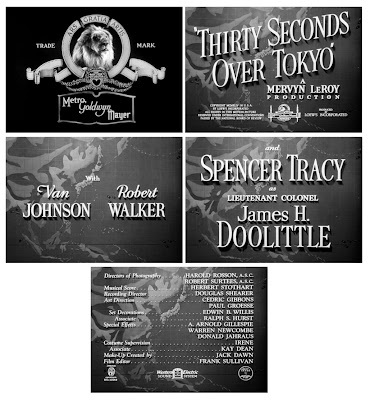 MGM was no different from most Hollywood studios in this regard where closely guarded little fiefdoms existed whereby heads of these various sub-sections often fought tooth and nail to maintain autonomy and power. 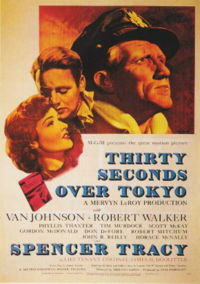 Paramount was notorious for this, with Farciot Edouart initially running the whole show and then moving aside into process, or transparency as they termed it, once Gordon Jennings came on board as overall effects chief, with Paul Lerpae later controlling optical compositing, Ivyl Burks with miniatures, Jan Domela on matte art and Wallace Kelly as process cinematography. The difference with MGM was the curious arrangement where Gillespie would control three of those effects categories personally - miniatures, process projection and mechanical effects - while Irving Ries would control optical compositing and Warren Newcombe would keep a very tight reign on mattes. I've read an account where on these boundaries were fought over quite strenuously between Buddy and Warren, at least in the case of FORBIDDEN PLANET, though these squabbles pale by comparison with the legendary face to face screaming matches frequently witnessed at Paramount under the reign of Gordon Jenning's successor, the creative yet very volatile John P.Fulton between John and members his unit (as well as directors and cameramen and all and sundry). A key member of the visual effects team here was the great Donald Jahraus - a long time associate of Gillespie specialising in miniatures who did wonders on shows such as the burning city of Rome for QUO VADIS (1950) and the amazing earthquake and tidal wave blasting colonial New Zealand (!!!) for the Oscar winning GREEN DOLPHIN STREET (1945) - a film I would love to examine here had my old vhs copy not eroded away to the ravages of mould - a film long overdue for dvd release schedules! It's been documented that Gillespie held Jahraus in the highest of regard, both as a friend and as a fellow trickshot craftsman. Another primary creative force in the success of not only this film, but most all of the big MGM effects shot films of the day, was miniatures first cameraman Maximillian Fabian - as skilled an effects cameraman as there was - and without whom I'm sure this film wouldn't have been half the success visually that it was. Effects man Bob MacDonald proclaimed "Fabian was probably one of most successful miniature cinematographers in the business because of his techniques used to shoot in sunlight". Of note too is the creative role played by former Willis O'Brien protege and miniaturist, Marcel Delgado who built many of the miniature sets here, presumably with a substantial team beneath him as they were so vast and so numerous. *I'd like to offer a special thank you to Buddy's grandson Robert Welch who has been very generous in regaling stories about Buddy and allowing me to look through many wonderful miniature effects photographs taken by Buddy at MGM.... very much appreciated. 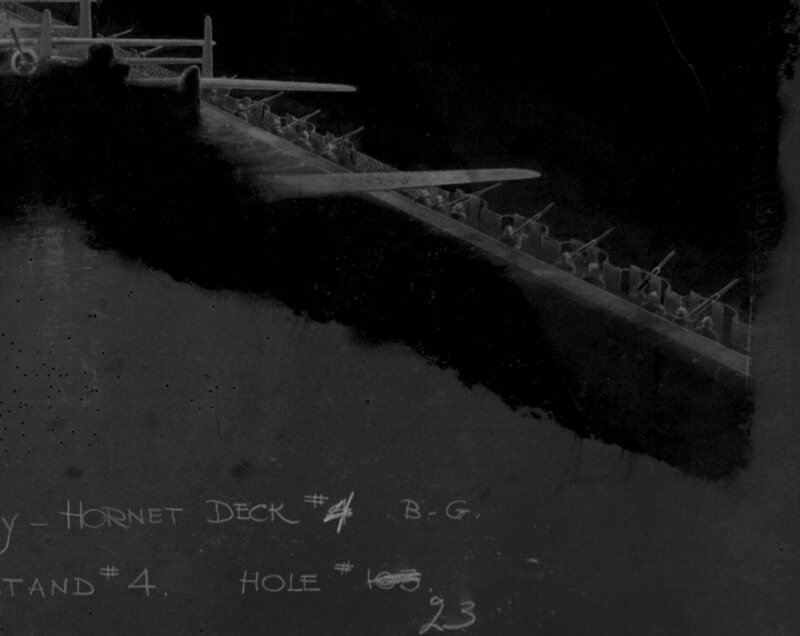 One of the first, and least visible visual effects is this process shot of the small 18 inch long off the shelf model aircraft carrier Hornet docked atop a plain painted sea. A sequence that normally slips by un-noticed is this where the pilots witness the loading of their precious B25's aboard the USS Hornet. The astonishingly realistic sixty foot in length Donald Jahraus miniature with tiny toy sailors atop and working crane and aircraft miniature are a sheer joy to behold and utterly convincing - both in physical application and in it's excellent process integration with the real actors in the foreground. Robert Walker is as amazed at the miniature/process scene in progress as I am analysing it. Excellent camerawork by the vastly talented Max Fabian totally sells this effect in my book, where often a serious focal depth problem might have occurred had the cinematographer not have been as skilled as Fabian. MGM's super outdoor tank at work. Measuring some 300 x 328 feet with a 60 foot painted backing, which as seen here is beautifully done by George Gibson's scenic art crew. Interestingly, the special camera craft used to photograph such shots was an old garbage skow, christened by the crew, "the SS Gillespie". I love this shot and can't for the life of me figure it out. Obviously a stage set as suggested by the typical indoor illumination, with, I'm guessing a mock up B25 landing gear and partial fuselage - with the rest painted in later and an absolutely perfect split screened in ocean plate taken from the outdoor tank. Just where the demarcation line between set and magic is a mystery. A tighter viewpoint would suggest rear process projection, but this is just too broad. 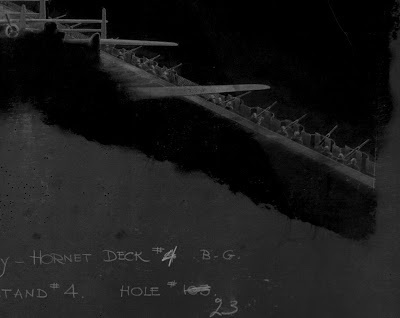 An extremely rare behind the scenes picture of an unused view of the miniature USS Hornet, supplied to me through the courtesy of the Arnold Gillespie estate which offers a magnificent and unused angle of the intricate miniature vessel, B25's on the tarmac and tiny sailors supplied by Marcel Delgado. This view also offers a wonderful glimpse at the vast Gibson painted backing and very convincing 'churning ocean' mechanical effects introduced into the tank. Just glorious! Now, I may be off target here, but I'd not be at all surprised to learn that these ceilings may very well have been furnished by Newcombe's matte department - a common practice at the time for reasons of economy and technical freedom. A night and a subsequent day view of the flight deck by way of a split screen model-matte-live action combo. An inaccurate shot breakdown from another source which assumed the live action component to be far greater than it actually was for the shot....... but Warren's boys fooled us all for decades as seen below. Newcombe's matte as it's not seen in the final film - here without the later added in foreground performers. I've added this out of curiosity as an interesting comparison of the ship and painted detail up against the technicolor ANCHORS AWEIGH made at MGM just a few years after. It's showtime...... the squadron begins the mission. 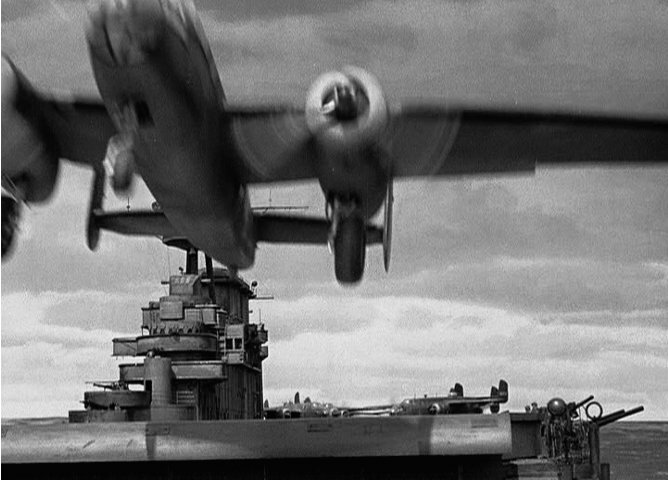 The miniature flight deck measured some 54 feet in length. Although this is a behind the scenes picture of the Gillespie unit shooting aircraft in the tank, it's unfortunately not from 30 SECONDS - instead it's from another MGM show A GUY NAMED JOE, made the very same year, which I've used here to give a good idea as to the general set up for these scenes. I'm assuming two of these men to be Jahraus and Fabian. More good examples of Max Fabian's model photography, combined with Buddy Gillespie's process work. 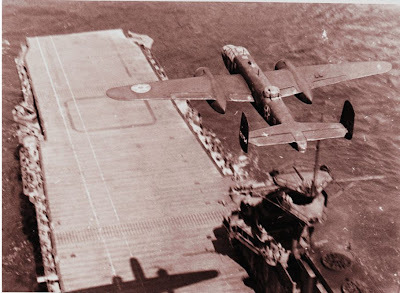 A rare, never before seen snapshot taken by Gillespie of one of the B25 miniatures 'floating' above the huge USS Hornet miniature in preparedness for a take. The industry standard of thin piano wire was utilised for model movement as it was relatively easy to render invisible through various on set means. Picture courtesy of the Arnold Gillespie estate. A close view of a B25 miniature just as it moves forward out of focal range. Another behind the scenes pic from A GUY NAMED JOE, demonstrating the Gillespie-Jahraus unit at work. A look at the typical MGM process screen set up used during the shooting of all of these cockpit scenes. Beautifully 'marionetted' B25 suspended from an overhead rig on vertical piano wires, in process with foreground extras. B25 cockpit POV of Mount Fuji in the distance. 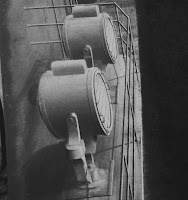 A stationary painting soft split screened with a rapid camera 'dolly' above the surface of the backlot tank. A wholly believable and courageous shot that only shows itself when viewed repeatedly. There are several shots of apparently authentic B25's flying over smoking ruins of obviously Asian looking cities which have me completely bamboozled. Not newsreel as the image is too good, they appear to be genuine to the best of my judgment, but just where and how these shots were made is a mystery, as the war was still very much an ongoing event? . Another GUY NAMED JOE effects set up which is a superb illustration of the general miniature shoot in progress. Miniature city combined in a Harold Lipstein process projection plate. 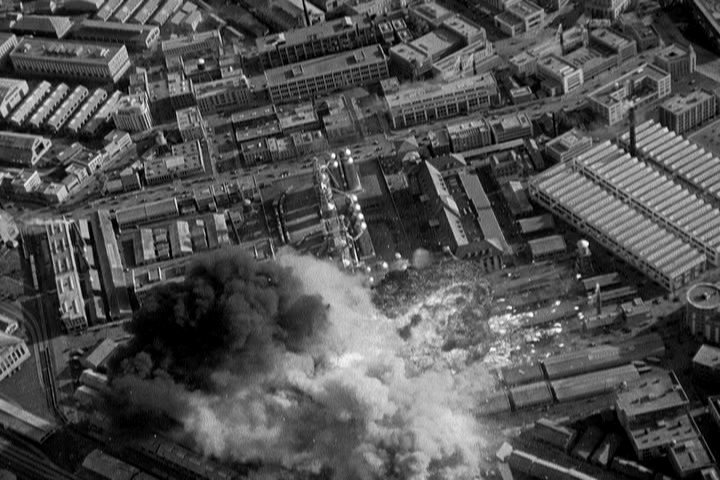 An excellent overview of just part of the Tokyo city miniature, just prior to the bombing. Now, it's so rare to see films pre Derek Meddings or Joe Viskocil where miniature pyro was so damned good.... but these guys, A.D Flowers and Glen Robinson were making these phenomenal shots work some twenty years before Gerry Anderson, with the results speaking for themselves. Flowers later came to fame of course with similarly spectacular miniature pyro fx in several Irwin Allen features of note, the astounding 'should have won the Oscar' Spielberg flick 1941 - but don't get me started on bloody Oscar injustices....... and the mammoth full scale work on APOCALYPSE NOW naturally. 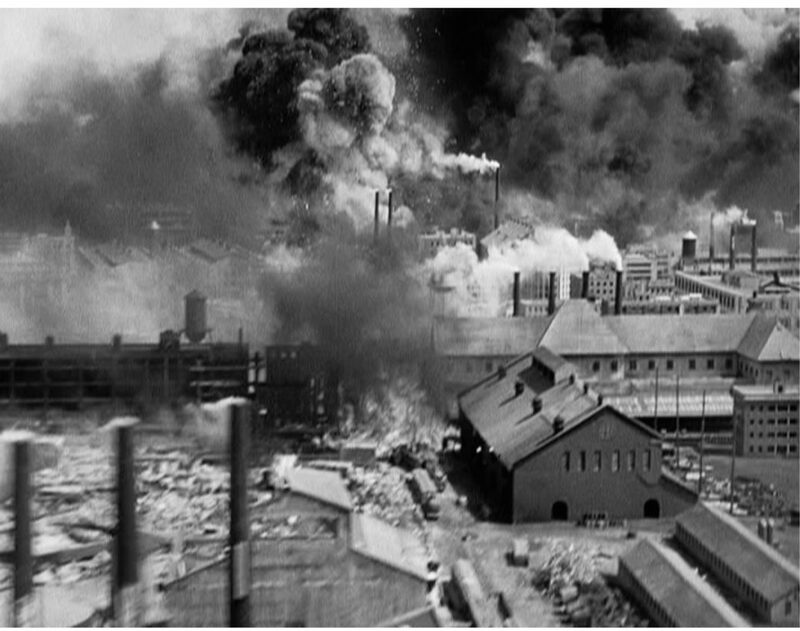 Scaled down conflagrations are only as good as the cinematographer.... and Max Fabian was among the best! 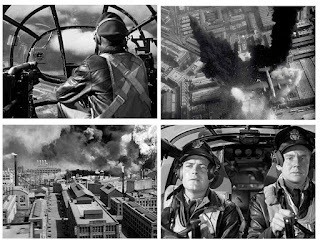 Now, to appreciate these frames the only way is to see the film in motion as these are no mere one off cuts of buildings blowing up, these frames (and most all of the others) are part of a jaw dropping continuous camera move across the roof tops at speed, accurately imitating the view from the underbelly of a B25, as the bombing occurs!!! 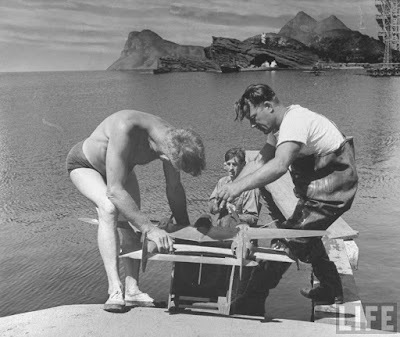 Never have I seen anything like this, and for a forties picture it is the very pinnacle of model camerawork in my book. Apparently Fabian used to prefer to shoot outdoors in actual sunlight - something seemingly lost on so many terrible model shots over the decades which fail for that very exclusion. Fabian would pump inordinate amounts of light into the set as a means of stopping down the lens as far as possible for maximum depth of field. Given film speeds of the day and lens optics especially later on in colour or worse still on CinemaScope shows where everything is literally squashed and fed through so much glass it's a wonder it ever worked at all - and that's just at the photography end.... projection was another matter entirely--- though as usual I digress! 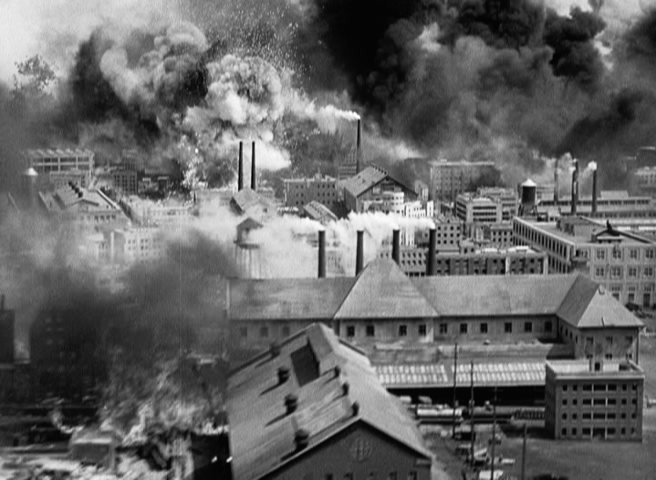 Bear in mind too, that this sequence would have been shot at a high frame rate - perhaps 96fps or more and as such the camera rig (which I assume to have been either a boom or maybe a suspended crane type of affair) must have been travelling at one hell of a rate of knots over the exploding city to compensate for the high frame rate. I'd so love to see photographic evidence of the camera set up for this amazing piece of virtuoso cinema. Light the touch paper and stand well clear.... Now kids, don't try this at home.. this is being done by trained professionals. 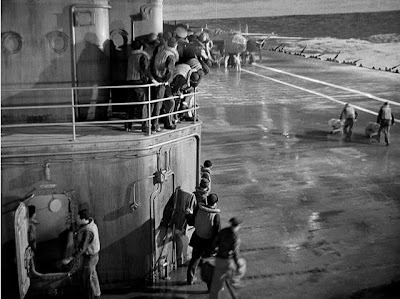 Again, in full motion, this scene is a winner - as in fact was the overall effects effort when the Academy, of whom I dump upon from a great height soooooo often actually got it right here ...... for once! Top left frame is an optical superimposition of falling bombs added by Irving Ries optical department over the top of Donald Jahraus's detailed miniature set. Once again, did you ever see scaled pyro effects as good as these? Nah... I didn't think so. Closer view of the whole shebang, with the guide wires faintly visible as the blast rocks the cables.With the impact of the blasts I'm astonished Gillespie and Jahraus managed to maintain steady model planes in these shots, especially when I witness the piano wire twanging as if ZZ Top were on either end of it during this shot! Noteworthy too by the way for great sound effects editing which really adds to the drama. I have been so fortunate to establish a link with Buddy's grandson and many fruitful discussions have come forth, though sadly not a clue as to the size of these miniatures, which I'd dearly love to know. 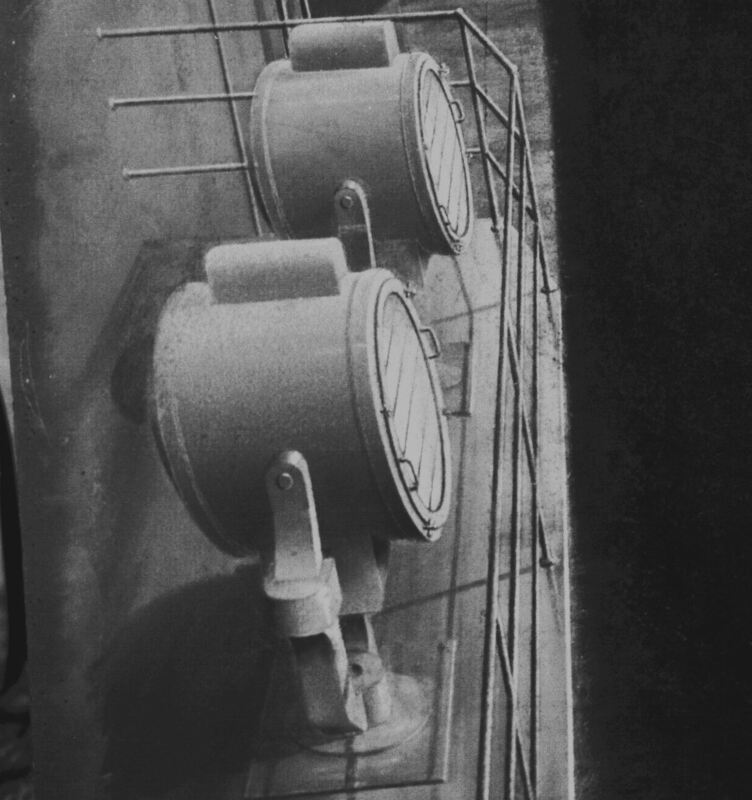 In the archival images I've been so privileged to look at on this film, not one shows an example of a technician with this set as a means of determining scale, though I can deduce that it must have been a massive set for these wizz-bangs to photograph so well. I'm guessing here, but I'd say something like four to six foot high being the average model building? Over at Fox, Fred Sersen's burning model hotels and such from IN OLD CHICAGO were on average 8 feet high. If any of Don Jahraus's kin folk are reading this, I'd love to know....can't rest till I know....sleepless nights getting to me. 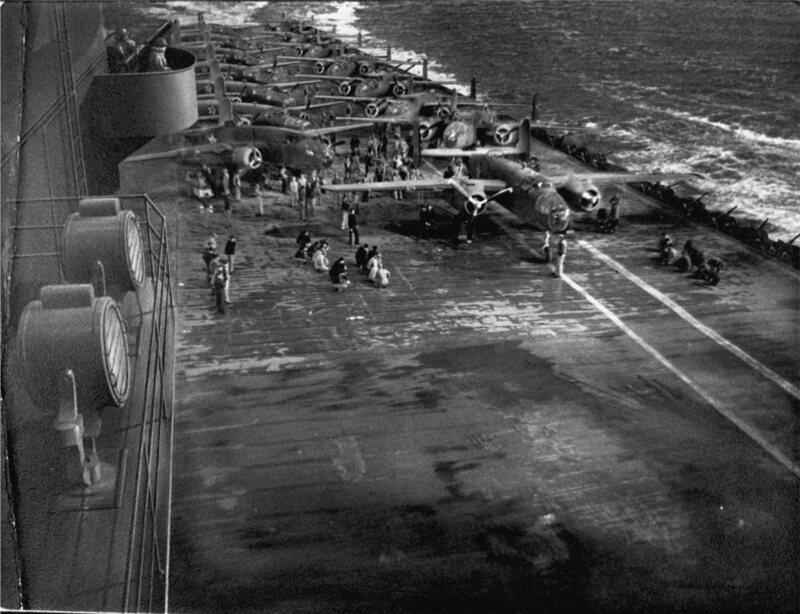 In actuality most of the planes were lost, and only a few crewmen survived, often after crash landing in Japanese occupied China due to lack of fuel to enable any sort of a return flight to the carrier. 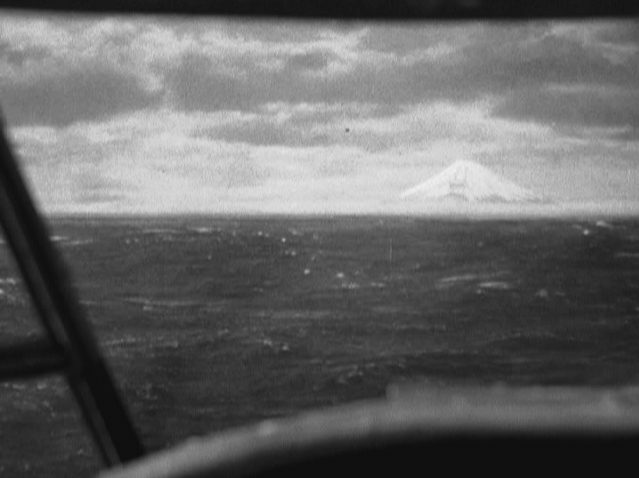 Left frame is a composite with sinking B25, possibly a piece of matte art with real sea plate and storm effect superimposed later. A masterpiece of MGM artistry is this, the first of numerous matte painted views of China which occupy the third act of the film as the downed pilots struggle to survive. One of the great surviving pieces of Newcombe supervised matte art, with just a small pocket of live action shot against a white backing, and an ingenious gag device built by matte cameraman Mark Davis whereby simulated water movement is introduced into the nearest rice paddy and is discernible for a moment, thus selling the shot. The sky may be real or perhaps a separate painting burnt in? Painting photo is from Craig Barron's indispensable tome, The Invisible Art - a book that everyone who reads this blog should own and cherish. God bless ya' Craig! More tremendous matte art from the long journey across China to safe haven - or is it? Combined miniature tank boats with an extensive Newcombe matte shot, more than likely a largely pastel crayon detailed affair, as a great many Newcombe shots were. Another brief matte painting from the trek across Japanese infiltrated China. Classic MGM matte art, so briefly shown, and during a dissolve that even getting this frame was a task! 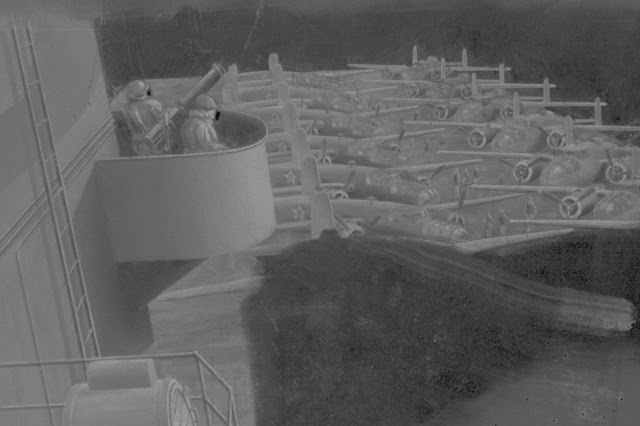 Matte art and process projection from the latter sequence where the Chinese villagers are tortured in revenge for helping the Americans. 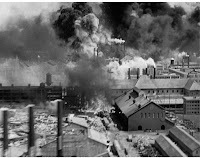 Apparently tens of thousands were executed in retaliation for the B25 raids. 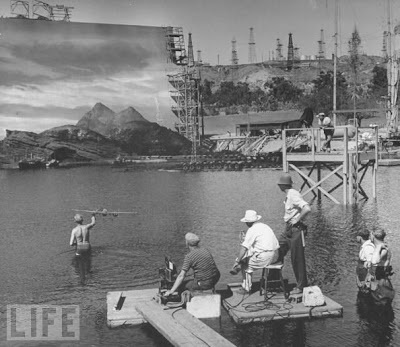 Matte painter Rufus Harrington at work on a typical Newcombe painting for an unknown film in the matte department around 1939. 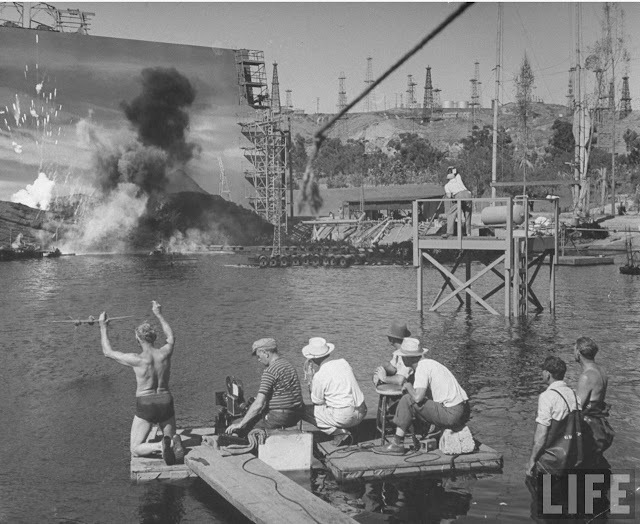 This picture gives the reader a good idea as to the methods employed at the esteemed matte unit at the time - the heyday of the matte art form. Interestingly, the paintings are to a large extent executed in pastel crayon - a method which may sound strange, but as an owner of one such piece I can vouch for the amazing level of detail and shading that was possible with that medium. Note too that unlike other images of matte departments Harrington and his fellow artists seem to do all artwork while seated, with a very low easel arrangement, as opposed to the Sersen unit at Fox where work was carried out on larger easels by painters, sans chairs. I don't know for sure who the individual painters were on 30 SECONDS, but assume them to be Norman Dawn and possibly also Rufus Harrington, Howard Fisher and Joe Duncan Gleason to name but a few painters engaged at the time. Van Johnson, stateside with a probable George Gibson painted backing behind. So endeth my THIRTY SECONDS OVER TOKYO blog. I'll be back with another Newcombe-Gillespie double act, BOOM TOWN (1940), when my somewhat fluctuating personality tells me "it's time".